Located nearly nine miles southeast of McKinney, the Higgins schoolhouse community is regarded as one of the thriftiest farming areas of our county. When this representative recently visited the spacious home of Mr. and Mrs. T. R. Meuir, we found the good lady of the house busy, canning pineapples for winter use. She believes in conservation of food and having it stored in the home, ready for use, anytime, as regular diet for the family or in an emergency meal. Mr. Meuir has a tractor with which he does much of his farm work. He has fairly good crops this year. Two of their sons, Floyd and Melvin Meuir and families, live on the big farm of their parents and assist in its cultivation. Their wives and Mrs. Meuir had just finished putting up sixteen quarts of cucumber pickles. Your representative was given some of these fresh cucumbers to take home with her. Mrs. T. R. Meuir was the daughter of the late Mr. and Mrs. W. F. Jones and is a native of Collin County. She is one of a large family of brothers an sisters as follows: J. C. Jones, Renner, Texas. 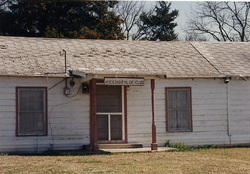 R. H. Jones, Vernon, Texas. John Jones, Route One, Carrollton, Texas. A. L. Jones, Route 2, McKinney. W. F. Jones, Parks, Texas. Ben Jones, Parks, Texas. Sam Jones and Ed Jones both of California. Mrs. J. D. Athey, Route 5, McKinney. Mrs. Minnie Athey, Corpus Christi, Texas. Mrs. Carrie Edwards, San Antonio, Texas. T. R. Meuir is a son of the late Jasper Meuir and wife. He was born and reared in Van Zandt County, East Texas, but came to Collin County, forty-four years ago. He was married to Miss Alice Jones, August 9, 1905. To their union were born eight children as follows: Delbert E. Meuir of McKinney. Floyd Meuir, Route 5, McKinney; Clifford Meuir, McKinney; David Meuir, Lampoc, California; Melvin Meuir, Route 5, McKinney; Walter Meuir, McKinney; Carl Meuir, in the CCC camp, located at Upper Lake, California and Mrs Leon Whitsell, Route 5, McKinney. The latter and husband live in the home with her parents at the present home. Mr. and Mrs. Floyd Meuir have two little daughters, Alma Ruth and Betty June. The young wife and mother is a daughter of Mrs. Mollie Mayfield of Wylie. Mr. and Mrs. Melvin Meuir are the parents of a pretty little baby daughter, Melba Lou. This young wife and mother is the daughter of Mr. and Mrs. Charley Morgan of the Higgins community. We were made happy by the dollar bill given us by T. R. Meuir to have his name enrolled on the Weekly Democrat-Gazette subscription list for another year in advance. They have formerly read the paper and like it very much. At the home of Wesley Shields and wife, we had the pleasure of meeting their charming young daughter, Miss Maude. The latter was born and reared on the same farm where the family is still living. She received her common school education at the Higgins school and then attended and graduated from the Princeton High School. This intelligent young girl will henceforth report the Higgins community news items for the Daily Courier-Gazette and Weekly Democrat-Gazette. Wesley Shields' first wife was Miss Lizzie Flemings. She died April , 1931. There were four children by this union. Mrs. Howard Jones and Mrs. Leland Dunn, both of Route 5, McKinney; Mrs. Paul Davis, Route 1, Princeton, and Miss Maude Shields at home. Mr. Shields then married Mrs. Caddie Oarmen of Princeton, who has two children, Mrs. John Carver, of Princeton and Lesie Oarmen, who is attending the Baptist Seminary at Decatur, Texas, preparing himself for the Baptist ministry. At the present time, however, he is at home, helping on the farm. Mr. Shields is a thrifty farmer who raises a diversity of crops and also gives due attention to raising cows, hogs, mules and white Rhode Island chickens. Mr. and Mrs. J. D. Athey have lived on the same farm for twenty years. Mrs. Athey was formerly Miss Eliza Jones, daughter of Mr. and Mrs. W. F. Jones and a sister of Mrs. T. H. Meuir. Her husband is a son of B. F. Athey and wife of the Lavon community in Southeast Collin. J. D. Athey and wife were married May 8, 1904. They are the parents of seven children as follows: Elmer Athey, Route 2, McKinney; Mrs. Lucille Anderson, Box 12, Beaver, Oklahoma; Mrs. Mae McMenamy, Route 5, McKinney; Woodrow Athey, Princeton; Earl, J. D. and Cecil A. they all at home. Mr. and Mrs. Athey have a variety of livestock and poultry about them. They also give due attention to growing vegetables in their garden and truck patches and have a little home orchard to produce their own fruit. They store away surplus products for winter and early spring use. Their children attend the Higgins School of which Prof. F Pritchard and wife were the teachers during the past term.